Loudonville, NY – The New York State Index of Consumer Sentiment in the first quarter of 2019 stands at 93.3 down 0.6 points from the last measurement in the fourth quarter of 2018, according to the latest poll by the Siena College Research Institute (SCRI). 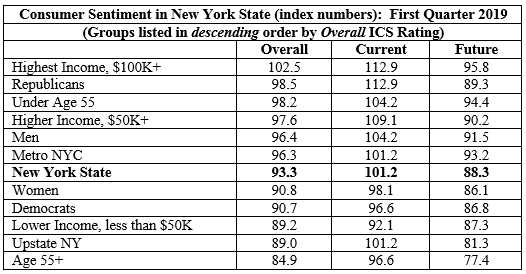 New York’s overall Index of Consumer Sentiment is 5.1 points below the nation’s* Index of 98.4. All three indexes for both the nation and New York are well above their breakeven points at which optimism and pessimism balance indicating strength in the consumer driven marketplace. 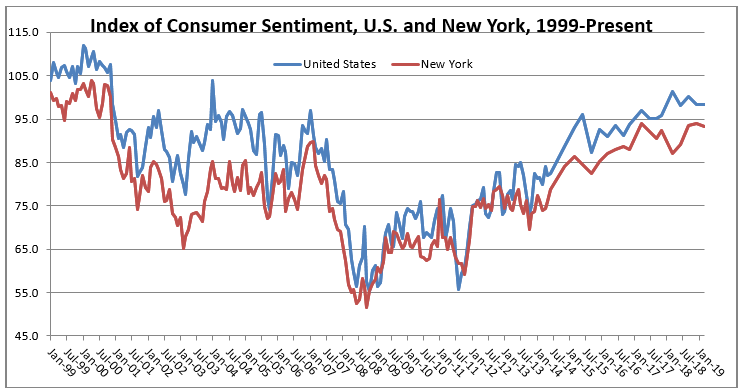 “New York’s Index of Consumer Sentiment remains in the low 90’s for the third consecutive quarter displaying continuing strength among consumers. Despite all numbers being well above the breakeven point at which optimism and pessimism are balanced, we see now that current sentiment – how we feel about today, and today compared to yesterday- is far stronger than future sentiment – what we expect tomorrow to look like. More than half of New Yorkers say that they are better off financially today than they were a year ago while fewer, 42 percent, anticipate being better off a year from today,” according to Dr. Doug Lonnstrom, professor of statistics and finance at Siena College and SCRI Founding Director. In the first quarter of 2019, buying plans were up since the fourth quarter of 2018 measurement for furniture to 33.9% (from 29.6%), and major home improvements to 23.2% (from 20.4%). Buying plans were down for cars/trucks to 23.7% (from 24.4%), consumer electronics to 49.4% (from 51.1%), and homes at 10.5% (from 12.0%). “Buying plans for all major consumer goods remain high indicating that New Yorkers plan to buy cars, electronics, furniture, homes and home improvements this spring at rates that will keep vendors busy. Concern over gas prices at 44 percent although up from a low of 29 percent a year ago should not slow the economy, and food worries at 59 percent remain in the range we’ve seen for several years,” Lonnstrom said. Forty-four percent of all New Yorkers say that current gasoline prices are having a very serious or somewhat serious impact on their financial condition. 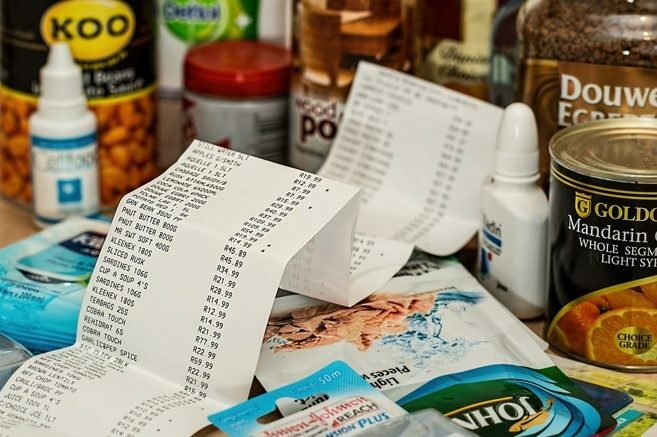 Fifty-nine percent of state residents indicate that the amount of money they spend on groceries is having either a very serious or somewhat serious impact on their finances. Thirty-six percent of state residents say that both gasoline and food prices are having either a somewhat or very serious impact on their finances. This Siena College Poll was conducted March 7-20, 2019 by random telephone calls to 384 New York adults via landline and cell phones and 420 responses drawn from a proprietary online panel of New Yorkers. Respondent sampling via phone was initiated by asking for the youngest male in the household. The overall results has an overall margin of error of +/- 3.6 percentage points including the design effects resulting from weighting when applied to buying plans and/or the perceived impacts of gas and food prices. As consumer sentiment is expressed as an index number developed after statistical calculations to a series of questions, “margin of error” does not apply to those indices. Telephone sampling was conducted via a stratified dual frame probability sample of landline and cell phone telephone numbers (both from ASDE Survey Sampler) from within New York State weighted to reflect known population patterns. Data from the telephone and web samples were blended and statistically adjusted by age, race/ethnicity and gender to ensure representativeness. The Siena College Research Institute, directed by Donald Levy, Ph.D., conducts political, economic, social and cultural research primarily in NYS. SCRI, an independent, non-partisan research institute, subscribes to the American Association of Public Opinion Research Code of Professional Ethics and Practices. For more information or comments, please call Dr. Doug Lonnstrm at 518-783-2362. Survey cross-tabulations and buying plans can be found at www.siena.edu/scri/cci. Be the first to comment on "Consumer Sentiment Strong; Current Outlook Far Better than Future"